This morning my cousin Beverly (actually my mother’s cousin Beverly) walked me to my car as I prepared to drive back to Florida. She and her family graciously hosted me for two nights as family gathered this week to celebrate the life of Katherine Adelaide Pfohl. Before we stepped outside, Beverly roused her daughter and son-in-law from sleep so we could say goodbye. Her husband, still recovering from a knee replacement, hopped up for a farewell hug. As this ritual began to unfold, part of me wanted to halt it, to tell folks “really, you mustn’t bother.” But I sensed that this part – the leave-taking — is just as important as the gathering together. Goodbyes honored properly bring a sense of closure. They make the time shared complete. I have not always been closely connected with either side of our family (my mother’s or father’s), but as I get older I have come to sense the importance of showing up. I want to know my family. I want to know my people. Our culture can convince us that extended family is not so important, that it is even dispensable, and lives geographically dispersed compound this. What I have found in connecting with family over the past couple of decades is that we are connected, have always been connected, and denial or absence cannot alter these mysterious, deep bonds. Some of the discomfort or awkwardness that we might describe as “being disconnected” speaks to the reality that we are part of an inescapable tapestry. Whether it is woven with strands of DNA or merely with emotional and spiritual bonds matters not. 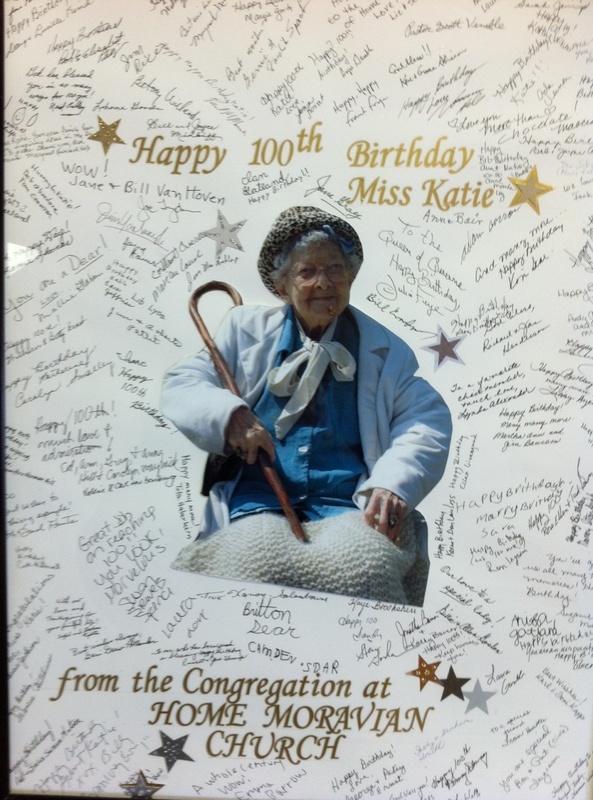 My great Aunt Katie lived well into her 105th year – and she did not waste any of it. One mourner told me that she had recently attributed her longevity two things: beginning each day of her life with song — and choosing to remain single. Outside of her nursing home room, she hung a sign that announced her philosophy of life, “Love Jesus,” and her greatest love, music. At her funeral service we sang her favorite hymns and listened to a moving duet of “Jesus Makes My Heart Rejoice.” When we stepped outside to process to the burial site, a sizeable Moravian band greeted us. We moved in a slow, holy sequence of prayer and hymns from the band, as we travelled from point to point. This may be a typical Moravian liturgy, but it certainly suited Katy. There was something rich and almost magical about this mourner’s dance, as we made our way on what had to be the most beautiful day this fall. Ritual matters. It is especially deep and rich when it includes moving our bodies, breathing deeply, and singing and praying. This procession was a dance that was both mournful and joyful. It was a way to celebrate Katie’s life and at the same time to embrace our grief. These thoughts had not formed in me at the time. I was simply drinking in the gift of being present with people who loved Katie. But as I drove home I thought of something I had experienced in Tanzania several years ago. We had been on a pilgrimage of sorts that included lots of time taking in God’s magnificent creation. One day our group opted to spend the entire afternoon in silence, and all agreed to keep that silence no matter what. There were long stretches where we sat, hearing little more than our own breathing as we watched the movement of wildebeests and zebra, elephant and other magical creatures. That night our guide George, a Masai tribesman, was in tears as he reflected on our afternoon. He had never been with a group who observed silence. 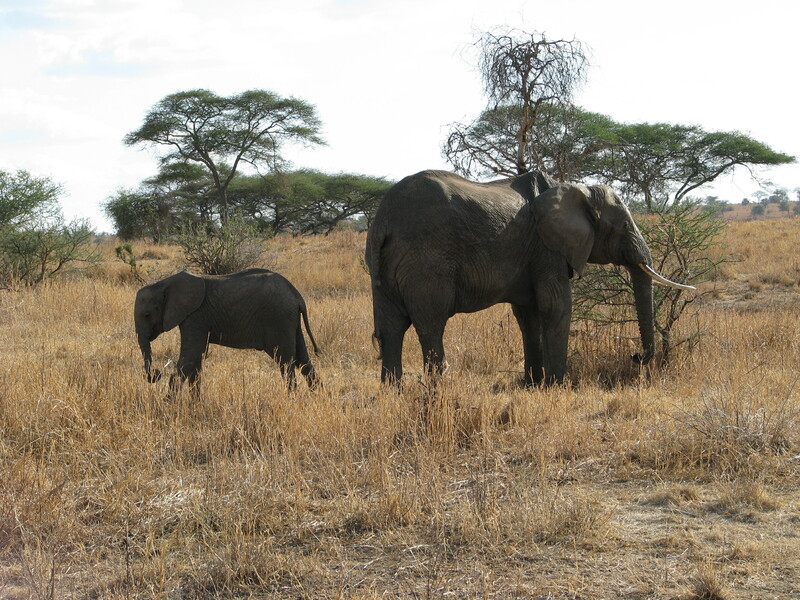 For him it brought back long-forgotten memories of watching a family of elephants make its way to an elephant graveyard, to encircle a dead bull elephant. The elephants swayed and danced around his bones, brushing their trunks against him. They understood that grieving and mourning are richest when experienced in community. Sometimes the most healing action we can take is to move toward the thing for which our hearts break rather than running from it. Recalling the richness of how elephants move through their liturgy of mourning gave our guide George permission to do his own spiritual work. Mourning is a good thing. It allows our grief to be what it is – something that will transform us. And if we allow ourselves to recognize our grief as good and holy, if we allow ourselves the space to mourn, we may find that all of creation mourns with us. Yea, my very name He knows. Led by Jesus as His sheep? Amen, yea, my lot is blest. This entry was posted in Christianity, faith, peace, unity and tagged Christianity, community, grief, healing, holy ground, hope, inner darkness, Moravian, mourning, spiritual growth, vulnerability. Bookmark the permalink.